Fickle Feline: Crazy Quilt Complete. 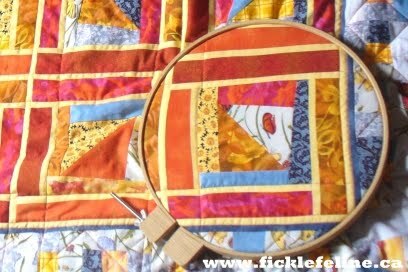 The crazy quilt is done. It took me less than a month from the first cut to the final stitch. Yep, I know, I rock. I mean, if you can quilt and rock at the same time. I suspect Scott would say this is impossible, and Jennifer would say "hell yeah!". All I'm thinking is thank dog. Shout outs (hah! I'm acting like I'm a rapper or something) to my mom and Aunt Inger who gave me sage advice on how to tie this thing together from a colour perspective and also told me when to stop adding blocks. Good thing too, because I have a hard time knowing when to wrap it up and this thing could have gotten into acreage territory. 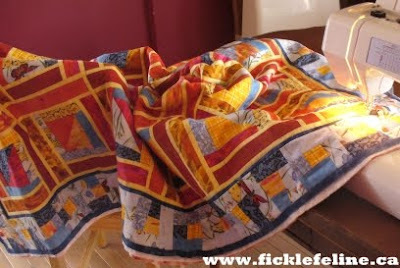 After I got sick of machine quilting, I hand quilted around the centre squares. It didn't take as long as I thought I would, because, I was thinking it was going to take FOREVER. 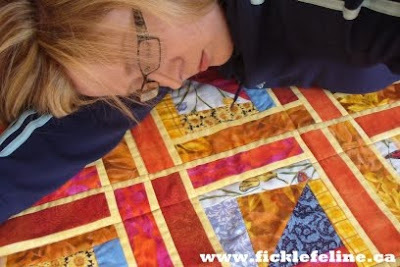 One of my favourite things about this quilt is the backing. I picked a super bright and cheery orange flower flannel. It made quilting this beast tolerable because you can't stay grumpy for long looking at this beautiful fabric. I have a feeling I will end up using it again some time. I wonder if it comes in lime green?? 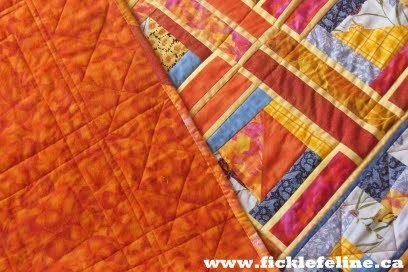 I used a combination of all of the orange fabrics for the binding which ties it all together really well. I ended up staying up until 1am to finish sewing on the binding. Scott found me like this in the morning (notice the new haircut). My best work yet for sure. Now onto the jelly roll quilt (which I finished basting last night). 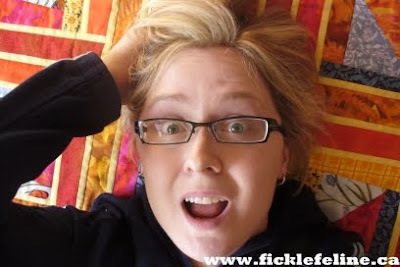 I'm going to quilt it by hand because I don't want to do anymore machine quilting until I take that class next month! Gorgeous! 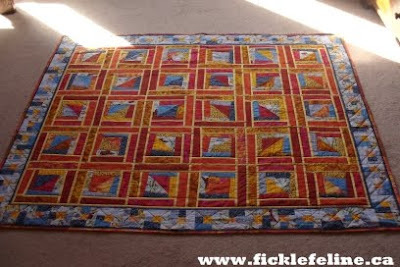 And the quilt is too! oh my what a thing of beauty! Good for you Katrina, super woman.